It has been sixteen years since the brutal and illegitimate invasion of Afghanistan by the savage American forces. Most American thinkers believe that in the recent years, instead of gaining anything new, they have mostly lost their previous achievements. Michael Colman, in this regard told CNN that in 2001 American forces succeeded in toppling the Taliban regime in a considerable short period of time, as Taliban could not resist against them for long. The invaders thought that the story was finished but it was soon revealed as a bitter reality that that starting a war is easy however bringing it to a successful end is a herculean task. The Americans learnt this bitter lesson in their futile war in Vietnam and subsequently in their invasion of Iraq. Reports say that after 2001, Taliban are now in control of larger areas than ever before and their expansion is increasing day by day. Though the American invaders spent billions of dollars and lost thousands of their military personnel but despite these huge financial losses and casualties, instead of achieving anything further, they have lost the achievements of all the previous years. Mr. Colman added that the Americans not only failed in restoring peace and security to Afghanistan, they failed to stabilize its economy as well. Afghanistan is the top-list country receiving tremendous funds collected and paid for by the Americans. In 2014, the puppet regime in Kabul received more 7 billion dollars aid from America and presently more than 4 million dollars are required to meet the extravagant spending of the stooge regime in Kabul. The economy of Afghanistan had a growth of 12% in 2012, but in 2015 it was on the verge of total collapse, as it had 0.5% growth only. The hasty withdrawal of foreign occupying forces severely undermined the Afghan economy, as it was not a well-established and real economy, rather it was a ‘war economy’ sustained and supported by the illegitimate presence of foreign occupying forces. When most of the foreign invaders evacuated, this illusive and instable economy broke down instantly. Ronal Lend, another American analyst elaborated the devotion and sincerity of Taliban by illustrating the example of one Talib fighter, narrated by ‘Abdul Jabbar Qaharman’, an old and seasoned commander of the mercenary forces in Helmand province then. He said that six sons of that Talib volunteer sacrificed their lives one after the other in fighting against the American invaders. When one of them was killed, the second one picked up the Kalashnikov and went to fighting; when he lost his life, the third one came forward, and so on. Eventually when all the six sons sacrificed their lives, the father himself girded up his loin and went to the battle field. Abdul Jabbar Qaharman, a member of the bogus parliament in Kabul who admits that 60% of Afghan territory is controlled by Taliban, added that no one can pacify these people in war as their numbers grow rapidly to substitute those who are killed in fighting. Ronal Lend concludes that Taliban have plans to resist and fight for time interminable, as they enjoy the control of vast areas surrounding districts and provincial centers which have almost turned into besieged islands, where only the flag of the stooge regime is hoisted and nothing more. Five years ago, the American security and intelligence agencies had estimated the total number of Taliban fighters to be roundabout 20,000. On the other hand, it is claimed by the American invaders that roughly 10,000 Taliban are killed per year. In this way, they should have finished in two or three years. But instead of vanishing, their number is increasing by leaps and bounds and their control is widening rapidly. It proves that they have long-lasting plans and have incalculable volunteers to substitute the deceased ones. This is the real picture of that futile war for which Donald Trump has launched his new ridiculous strategy in hope of bringing it to a successful end as desired by the ill-advised American invaders. Ann Jones writes in the weekly ‘The Nation’ of New York that Trump has entirely forgotten about his strong antagonism of ‘Obama’s war strategy’ in his election campaign. He now has taken a U turn by stating that we are not there (in Afghanistan) for nation building but for eliminating terrorists. He says that we will not allow Afghanistan to be become sanctuary for terrorists once again. The same ridiculous and baseless rhetoric was repeated by his predecessors i.e. Bush and Obama. It seems that Donald Trump does not know or does not want to know that none of the 19 attackers of 9/11 were from Afghanistan. They belonged to the Middle East and their sanctuaries were in San Diego, Arizona, Phoenix, Massachusetts, New Jersey, Hollywood and Fort Lee. Trump should realize that all these places are situated in America and not in Afghanistan. That 19 people had the American licenses and were living there. Ann Jones concludes that now, as additional forces are being sent to Afghanistan, I don’t really know what lesson we have learnt in the previous sixteen years from Afghanistan. In 2010 after meeting my colleagues in Afghanistan, I realized that the American forces are given a free hand there, as whatever serious felony is committed by them, it is not properly reported in the media. The report released by the American generals depict a picture showing that all their war strategies are working effectively and they are succeeding in their fight by eliminating terrorists (mentioning no signs of everyday civilian losses and casualties). But when it comes to reality, Taliban have not been defeated rather they have increased and expanded. Isn’t it astonishing that American forces are still considering themselves triumphant and unbeatable? The bitter reality is that they (the American forces) cannot achieve anything even if they remain there for sixteen years more!!! Trump is insisting on a long-lasting war in Afghanistan, but all know that he has not properly analyzed the real situation yet. The American forces have been extremely demoralized by suffering huge financial losses and heavy casualties in the longest and most futile war of their contemporary history. They have suffered both physiologically and psychologically, therefore they have lost their morale substantially. Twenty percent of suicide incidents occurring in America are related to these war torn military personnel. Number of suicide cases in American armed forces have significantly increased after their invasion of Afghanistan and then Iraq. In 2001, one hundred and forty five (145) soldiers had committed suicide. 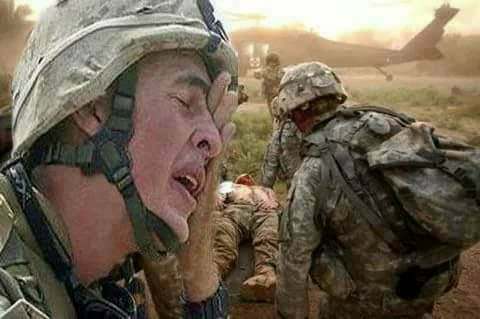 The period from 2004 to 2009 was the most hazardous and difficult time for the American invading forces, as thousands of suicide cases were reported among them during that time-period. In 2012 three hundred and fifty (350) soldiers committed suicide, whereas according to their own confirmation 311 troops were killed in the battle-fields during current year. At that time a high ranking commander of the American forces committed suicide, as he had been fighting for long in various military operations and was suffering from severe mental disorders. He wrote in his last message, ‘my colleagues might think I was very strong but the reality is that I was totally broken from within.’ The spouse of that commander said that after returning from Iraq, her husband was deeply upset due to his three close comrades who had already committed suicide. Most of the American troops who were discharging their duties in Afghanistan and Iraq, have joined their families by returning to their hometowns but they are still suffering from deep anxiety and stress. Their main concern is that they might be deployed once again in the futile conflicts waged by the American war-monger authorities in various parts of the world, particularly the incessant war in Afghanistan which is not going to come to an end as vowed by their new president. These veterans are in constant trouble with their families as they are not properly revered by the masses for their futile military services therefore they resort to drugs and other intoxicants and most of the time they lose their lives due to excessive and heavy drinking. Prudent experts believe that the motives behind the rising number of suicidal incidents are the extensive and intensive wars waged by America for achieving their colonial and vicious objectives in different parts of the world under the disguise of fictional slogans of ‘war against terror’ and ‘safeguarding human rights’. Therefore, Dominic Terry had written in 2015 in the ‘Atlantic’ magazine that talking about Afghanistan is actually talking about one’s death. It has become a nightmare for the people and they want to change the topic abruptly. Irrespective of Trump desires and strategy for Afghanistan, the reality is that a significant majority of American military commanders and other related authorities want to end this futile and interminable war in Afghanistan. A war which has become a quagmire for all the foreign invaders, as the more they use their force, they more they are entrapped. They now seek to relieve their shoulders by shifting this quandary either completely to NATO or to share it with their Indian stakeholders. In the recent visit of the American defense minister, James Mattis, to New Delhi in the last week of September, the Indian government was formally asked to send their troops to substitute the American forces and shouldering the war in Afghanistan. But the Indian defense minister, Mrs. Nirmala Seta, unequivocally told the Americans that they are not ready to deploy their forces to Afghanistan. A renowned Indian writer, Dr. Ved Partab, who enjoys quite close relations with the Indian Prime Minister Mody, recollects his memories by writing that he had a long 3 hour meeting with his old friend, Babrak Karmal, the then puppet president of Afghanistan. His opening remarks were that if the Indian forces could replace the then Soviet troops in Afghanistan, it would work out. At that time I fully explained all the constraints and limits why the Indian forces could not be deployed there. Since history repeats itself, now it is the same scenario where the freedom loving people of Afghanistan have beaten the Americans and other allied forces, they want to transfer their misfortune to their Indian counterparts who are not ready to assume this unresolvable dilemma!! !